With over 750 million active users as of July 2011, Facebook has become a unique and effective way to advertise to an utterly vast number of users. Whether you’re a local greengrocer, a teenage rock band, or a multi-million dollar international corporation, everyone is making their presence known on the Facebook network. One of the best ways you can do this is to create your own page for your business/firm/product/rock band, which is relatively straightforward and can be done pretty quickly. To create a truly effective Facebook page however, one needs to consider the all-important and all-powerful Vanity URL. As you’re probably aware, URLs are pretty vital for the success of your online presence. Where Facebook Vanity URLs can help out is that they provide a shorter, more readily remembered and more easily typed link to your page. So rather than ending up with the lengthy URL chosen for you by Facebook (often numbers), or one badly chosen by you – “http://www.facebook.com/bobs-fruit-and-veg-green-grocer-on-the-high-street-down-by-the-old-church-but-if-you-have-gone-past-the-post-office-you-have-gone-to-far/”, why not go for “http://www.facebook.com/bobsfruitandveg”? 1) If you haven’t done so already, set up your Facebook page. 3) The important part – visit http://www.facebook.com/username. Here you can choose the URL you desire, so long as it is still available. Consider this carefully – you cannot currently change your Vanity Facebook URL after your initial selection. Make it easy to remember but also relevant to your business/product/service etc. Often the business name will be the best choice. 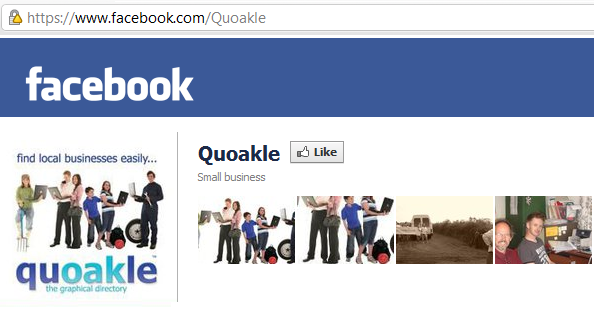 For example, for us at Quoakle it was important to carry our branding over into the medium of Facebook – see the image below or visit the real thing at http://www.facebook.com/Quoakle. 4) Success! Your business now has it’s very own Vanity Facebook URL. Now go share it with the world!